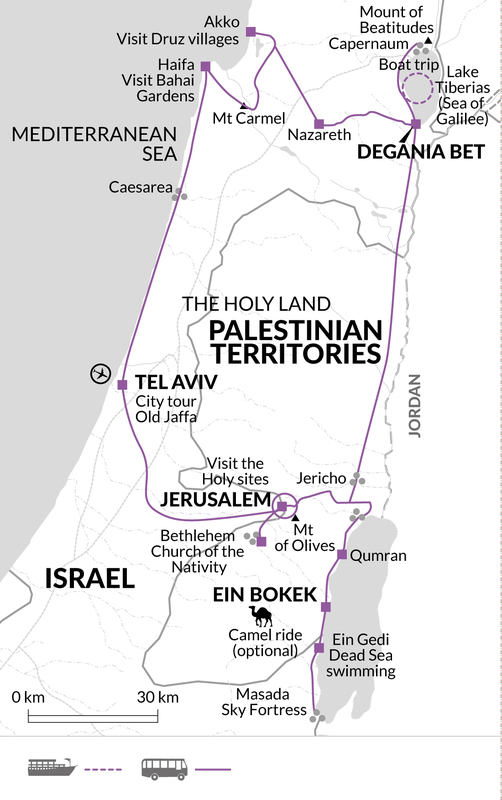 On this journey we explore some of the Holy Land's greatest cultural and religious sites. We roam through the narrow streets of the Old City of Jerusalem and visit the Church of the Nativity and the Wailing Wall. We also take a dip in the Dead Sea, enjoy local Bedouin hospitality and take a cable car to the impressive sky fortress of Masada. Join your tour in Tel Aviv and check into hotel. Tel Aviv, often called 'the city that never stops' was the first modern Jewish city built in Israel, and is the country's economic and cultural centre. It is a lively, active city with entertainment, culture and art, festivals, and a rich night life. Situated on a 14km long strip of the Mediterranean coast, Tel Aviv extends beyond the Yarkon River to the north and the Ayalon River to the east. Hundreds of thousands of workers, visitors, tourists, and partygoers move about the city each day. Israel's second largest city, Tel Aviv was founded at the beginning of the 20th century on the outskirts of the old port city of Jaffa. We'll get a chance to take a tour of this impressive 1930s architecture this morning, as we walk through the historic centre to the trendy neighbourhood of Neve Tzedek. From here we will board our bus to ancient port area of Jaffa and continue to the ruins of Caesarea. We travel along Israel's northern coast and journey to the historic city of Haifa, where we take in the panoramic views from the slopes of Mount Carmel and see the Bahá'í Gardens. We visit the crusader-era Knights Halls in Akko, a large stone fortification built to protect the town from marine attacks before making our way to our Kibbutz at Degania Bet, at the Sea of Galilee. A kibbutz is a collective community of people in Israel based mainly on agriculture and shared living. They began in the 1920's and currently there are approximately 270 kibbutzim in Israel. Today we visit the important Christian sites of Tabgha and Capernaum. It was at Tabgha, where one of the most significant events of the New Testament saw the feeding of the 5,000. We will have an opportunity to visit the Church of the Multiplication of the Loaves, the Church of the Primacy of St Peter and the Mount itself, before continuing on to Capernaum, the birthplace of St. Peter and the site where it is believed Jesus first started his ministry. Taking an afternoon boat trip out onto the waters of the Sea of Galilee, we then head for our kibbutz, close to the historic city of Tiberias. This afternoon we will make a tour of Nazareth to visit the Basilica of the Annunciation and St. Joseph's Church. We will then have free time to explore the town and local market before returning to our kibbutz for the night. This morning we take a tour of our kibbutz, to meet some of the residents and to understand their way of life, before heading off towards the Jordan Valley to the ancient city of Jericho. Lying amidst the hotly contested settlements of the West Bank, Jericho was the first city to fly the flag of the newly formed Palestinian state and its history stretches back some ten millennia. We meet our local guide on arrival and ascend via cable car to the Monastery on the Mount of Temptation where we will enjoy sprawling views over the valley below. After visiting Jericho town, we'll make our way to Qumran, the home of the Essenes, a strict and devout Jewish sect who lived in the area until early in the 1st century AD. It is believed that the Essenes were the authors of the 2,000 year old manuscripts found amongst the hillside caves in 1947, and after lunch here we will visit the local caves and learning about the ancient Dead Sea scrolls. Later this afternoon we'll have a chance to float in the Dead Sea. At 418m below sea level, this salty expanse of mineral rich water is the lowest point on earth and has been revered for centuries for its beneficial properties. After some time to enjoy this experience, we'll return to our Kibbutz. We start the day with a trip to Ein Gedi, a natural oasis in the desert, protected as a nature reserve where we will take a short walk to a natural spring. Back on the bus, we will continue along the western shores of the Dead Sea to the isolated hilltop fortress city of Masada, the last stronghold of the Zealots against the Romans during the First Revolt in AD 70. From the top of the citadel there are some stunning views of the surrounding desert, including the mountains of Moab and the Dead Sea. We then move on to Jerusalem, our base for the next few nights; this evening there is the option of a light and sound show at the Tower of David. This morning we drive through the new part of Jerusalem, taking in the Hebrew University, the Parliament building and the Supreme Court, before continuing to the Israel Museum and the Shrine of the Book, home of the Dead Sea Scrolls parchments and the largest museum to all things Israeli anywhere on the planet. Passing by Ein Karem we then visit the Church of St John the Baptist, before making our final visit of the day to Bethlehem and the Church of the Nativity. The original building was believed to have been built by the Empress Helena, the mother of Constantine, the emperor who legalised Christianity in 313AD. From here we return to Jerusalem and drive to the Western Wall to witness the Shabbat prayers, where thousands of people gather to welcome the Sabbath. This evening there is the option to experience Shaabat of a life time, spending the evening with an Israeli family as they say Friday night prayers to celebrate the Sabbath. Certainly one of the world's most intriguing cities, Jerusalem can boast a history stretching back some three millennia, and during its long history it has been destroyed twice, besieged 23 times, attacked 52 times and recaptured 44 times. This morning we take a drive up to the Mount of Olives. This provides a superb view across the Old City, and we then descend into the Josaphat Valley to visit the Pater Noster Church, Dominus Flevit, the Garden of Gethsemane and the Church of All Nations. Entering the Old City we then visit the Pool of Bathsheba, before taking a walking tour of this most hallowed of settings. Passing through narrow winding streets overflowing with street vendors and shops, we head to the Via Dolorosa, traditionally believed to be the route taken by Christ on the day of his execution. We will follow the Stations of the Cross to the Church of the Holy Sepulchre, the holiest site in Christendom and the reputed place of the crucifixion, burial and eventual resurrection of Jesus Christ. Jerusalem is unique in that it is held sacred by the three great monotheistic religions of the world, Christianity, Islam and Judaism. Finally we head up onto the slopes of Mount Zion, where we visit the tomb of King David, the beautiful Benedictine Abbey of the Dormition and the Cenacle, which since the 4th century has been identified as the site of the Last Supper. After our visit here we return to our hotel. The majority of today will be on foot, however there is the option of using transport for those that are struggling. Tour ends after breakfast in Jerusalem. Israel has a Mediterranean climate. Summer is hot with fairly high humidity in coastal regions. Rainfall is mostly from November to March: during this period temperatures can drop quite sharply, particularly in December, so pack accordingly. Shabbat of a Lifetime - Friday night - $60.00 pp (depending on numbers and availability). If you would like to book the Shabbat of a Lifetime experience please use this website: www.shabbatofalifetime.com . Please note this is a very popular excursion so we do advise to pre-book early. Clothes should be casual and practical. Long trousers should be worn in some Jewish and Christian holy places, and women must cover their arms, legs and head. In the warm, summer months Israel can get very hot during the height of the day, so lightweight and loose fitting clothing is recommended when visiting conservative areas. A hat and sunglasses are recommended. During winter, medium weight clothing for layering and rainwear is advisable. A fleece will be useful during this time for early mornings (Masada visit) when it can be chilly. An umbrella can be useful! Pack swimwear and a towel for your visit to the Dead Sea. Comfortable walking shoes or boots needed for the walks as the terrain can be uneven or slippery from rain, trainers and sandals for the remainder of the trip. One suitcase, and a daypack is useful. A towel for the Dead Sea visit and an umbrella during the winter months. Tour Leader: In Israel, it is customary to tip the tour leader in appreciation of the efficiency and service you receive. We would recommend allowing approximately $6-$8 per day as a guideline but this is at your discretion. In Israel tipping at 15%-20% is a recognised part of life across the service industry, including restaurants, activity suppliers, taxis and guides. Local staff will look to you for personal recognition of particular services provided. Your leader will arrange a tips kitty for activities and services included in the itinerary, so we recommend you allow $45 per person for this tips kitty. For anything outside of the included activities and services, your leader will be happy to offer advice on tipping. Travellers Cheques are not easily exchanged and should be avoided. Throughout this trip the accommodation varies in style, standard and size. In Tel Aviv, we stay in a boutique style accommodation in the city centre. The beach is just 5 minutes' walk away, the hotel offers an excellent breakfast and a roof-top bar is open during the warmer months. Our kibbutz stays, offer an insight into a traditional and alternative way of living found throughout Israel. All rooms are spacious, clean and the kibbutz offer nice communal areas and swimming pools throughout the warmer months (subject to set opening times). At the kibbutz dinners will be served in a communal dining room where both guests and residents eat alongside one another on long tables, and you choose from a cafeteria-style buffet selection of hot and cold food. In Jerusalem, we stay in a centrally located hostel, just minutes from Jaffa Gate into the Old City, in the post office building. We have graded the hostel as 'standard' because although the property features dormitory rooms, all Explore customers stay in private twin-share accommodation with en-suite. Whilst the rooms are small and simply furnished, they are clean and all feature private bathroom facilities, making it a great base from which to explore this historic capital city. There is also a large communal area with comfortable seating, a bar and their roof terrace is open during the warmer months. The main highlight of this accommodation is its central location, with many of Jerusalem's highlights just a walk away and access to the city's modern tram just 100m away. Israel & Palestinian Territories: Visas are not required by UK, New Zealand, Australian, US & Canadian citizens. Other nationalities should consult their local embassy or consular office. Note: You will now be given a visa card at immigration with your details on it. This replaces a stamp in your passport and must be kept safe as it will be required when exiting the country. Nothing compulsory, we recommend protection against, typhoid, tetanus, diphtheria, polio, rabies, hepatitis A and B. Please check the latest requirements with your travel clinic or doctor prior to departure. The above is not an exhaustive list. Further information regarding vaccinations and travel health advice can be found by following the NHS and NaTHNaC links at Explore Travel Health and from your local healthcare provider. Visa and vaccination requirements are subject to change and should be confirmed by you before travelling.